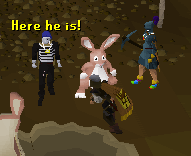 Just like in past Easter events (see the Easter 2006 and 2007 guides), the Easter Bunny has gotten himself into another predicament this year. Creatures have been burrowing into his warren and eating the chocolate he's been storing! And without any chocolate eggs being produced, and with Easter right around the corner, the Easter Bunny needs a plan to build his egg stock back up. Note: This event was only available from 18 March 2008 until 31 March 2008. 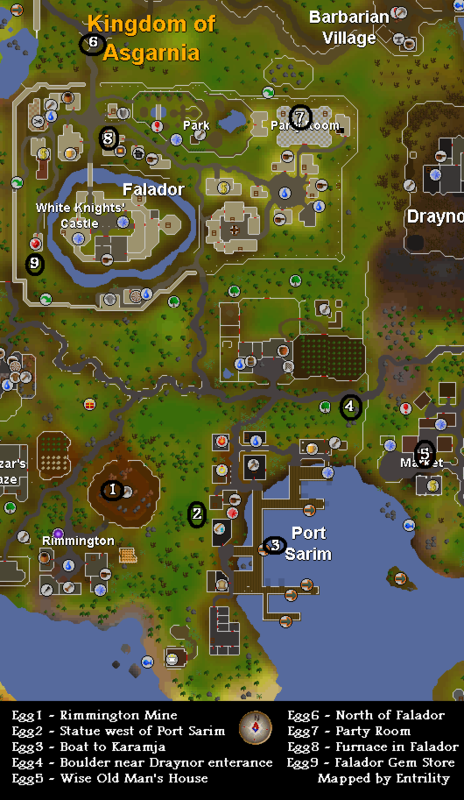 Enter the Rabbit Hole south of Falador, north of Rimmington, or west of Draynor Village. 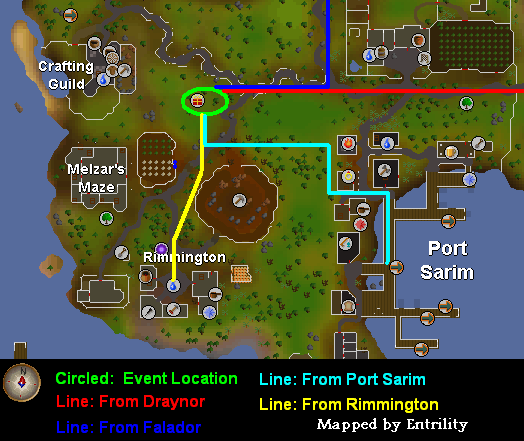 To start, go south of Falador, north of Rimmington, or west of Draynor Village and Port Sarim to get to the event. Now, click on the hole to start the event. After clicking on the hole, a conversation will ensue. After the conversation, the first part of the event begins! Go find your eggs! You need to find three eggs to bring back to the warren. While you only need three, all nine are listed here. You cannot get the same egg more than once. 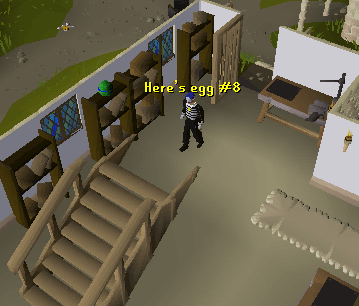 To obtain an egg, simply click on it. Egg #1 is just south of the warren. 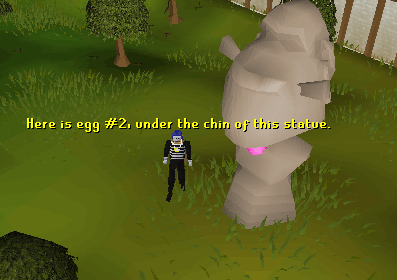 Egg #2 is underneath the chin of the statue pictured below. 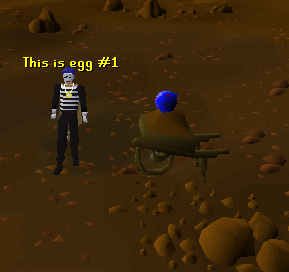 Egg #3 is on the ship that sails to Karamja in Port Sarim. 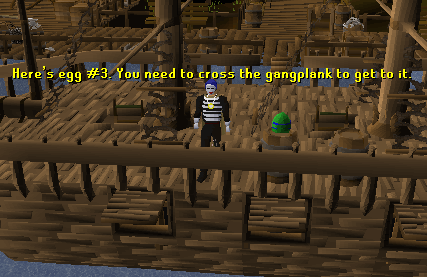 You need to cross the gangplank to get to it. 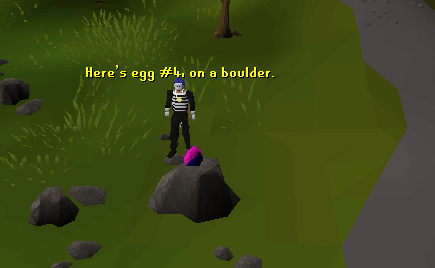 Egg #4 is on a boulder north of Port Sarim and west of Draynor. 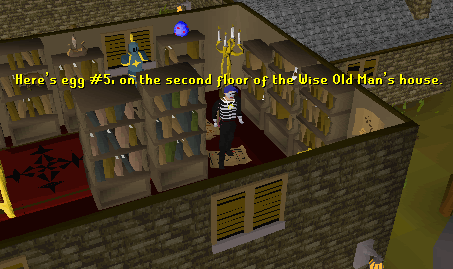 Egg #5 is on a shelf on the second floor of the Wise Old Man's house, which is located across from the Draynor bank. 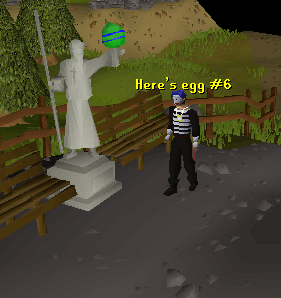 Egg #6 is on the path directly north of Falador. 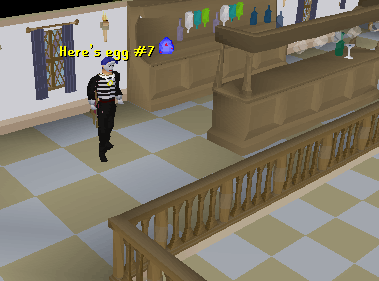 Egg #7 is behind the bar on the second floor of the Party Room. It is on the north wall of the room. 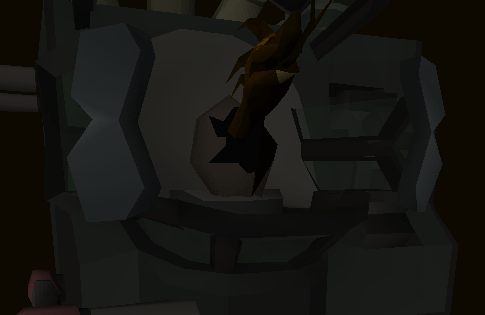 Egg #8 is in the furnace room near the center of Falador. 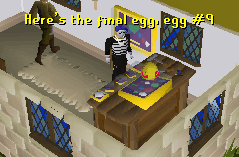 Egg #9 is in the Falador Gem Shop, just south of Falador's west bank. Each egg has four options. Eat, Use, Destroy, and Examine. You cannot eat the egg until after you've completed the event and found more eggs. If you destroy an egg, it reappears at whatever location you found it at. You cannot find an egg after you've given it to the Easter Bunny. If you find one after you've given the Easter Bunny three eggs, you can eat it to heal 20 Life Points. See the section on rewards to learn more. Keep in mind that these eggs turn to chocolate dust after the event is over. Now that you have your eggs, return to the hole to give the bunny your eggs. You are now ready to start the next part of the event! 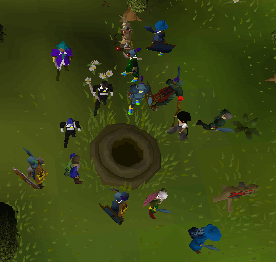 To start this portion of the event, enter the hole. 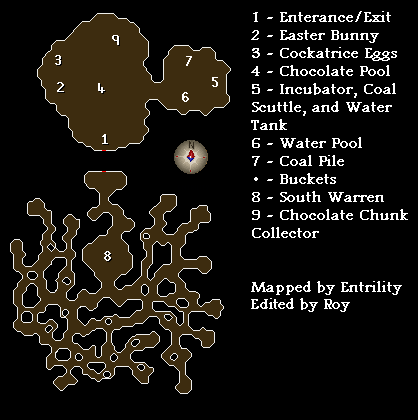 Upon entering, you will unlock a new track, Bittersweet Bunny. Go and talk to the Easter Bunny. You need to hatch a chocatrice. To begin, pick up a cockatrice egg. Now walk to the chocolate pool and dip your egg into it. Go over to the incubator with your chocatrice egg, and place it inside. Now, go get some buckets to fill up with coal and water, in order to adjust the temperature. You will probably want more than five buckets for each material. Fill some buckets with water. 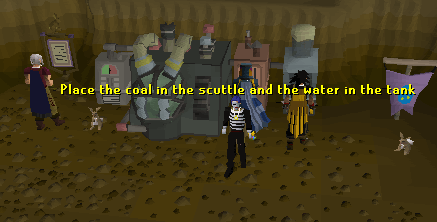 Fill the rest of the buckets with coal. Now, put your coal and water into the Coal Scuttle and Water Tank in the incubator. Now for the tricky part. You need to get the black needle to match up with the blue pointer which measures the target temperature. To increase the temperature, click on the picture of fire. To decrease the temperature, click on the picture of a drop of water. 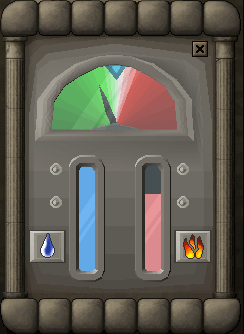 The meter next to the two icons shows how much coal and water you have left to use. You may need to increase or decrease the temperature to above or below the target to get the correct temperature, and you may need to leave the controls to re-fill the Coal Scuttle or Water Tank. When you get the correct temperature, you will get a message saying that the target temperature has been changed. You need to get the target temperature a total of five times to hatch your chocatrice. After your chocatrice has hatched, you no longer need your buckets. 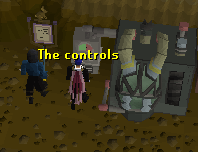 They will automatically leave your inventory. Now, speak to the Easter Bunny again to figure out what has happened. At this point, you get to transform into a rabbit! This is the final part of the Easter 2008 event. 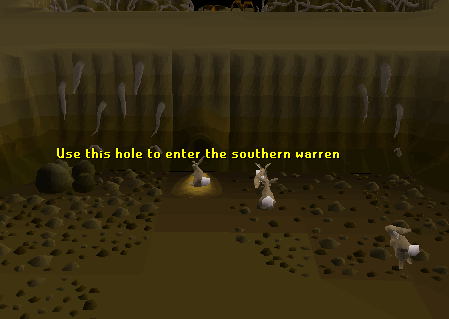 You need to go to the southern warren for this part. The entrance to the southern warren is at the southernmost point of the main warren. Once you enter the southern warren, you will be followed by your chocatrice. Both members and freeplayers will have access to the summoning toolbar for this part of the event. 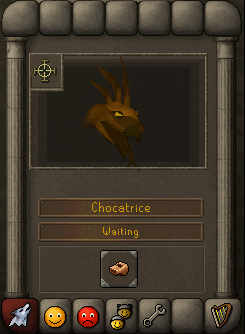 If you get separated from your chocatrice, click on the whistle at the bottom of the menu to call it. 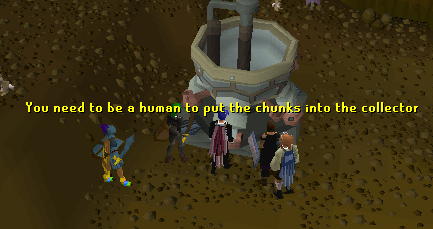 For this portion of the event, you need to use your chocatrice to turn rats, mice, spiders, and cockroaches into chocolate chunks. To do so, click on the cross hairs in the top left corner of the summoning menu, and then click on a creature to target. Once you've targeted your creature, you will shout an insult to your chocatrice, infuriating it to the point where it attacks the creature you have targeted. Unfortunately, if you target a creature someone else is already targeting, you will stop targeting it. This may cause you to take a longer time collecting your chocolate chunks. Also, if your chocatrice cannot see the target, it will not attack it. The chocatrice can see the target if there is a direct line between the chocatrice and its target. The attack will not stop after your chocatrice has spit its chocolate. Once you have a total of twelve chocolate chunks, return to the main warren and place them in the Chocolate Chunk collector. After inserting your twelve chunks of chocolate, you will automatically be in conversation with the Easter Bunny. Congratulations, you have now completed the event! If you do not already have the Bunny Hop emote, you can talk to the Easter Bunny, and get another ten chocolate chunks to obtain this Easter emote! For your efforts, you will receive a cape, which when operated, will perform a new emote. In this emote, you spin a chocolate egg around you, and then burst out of it. Also, if you talk to the Easter Bunny again, you can get chocolate Easter eggs for more chocolate chunks. You need eight chunks for the first egg, six for the second, and four for the third. You cannot get more than three eggs. Unfortunatly, the eggs crumble to chocolate dust on the 31st of March. Happy Easter from Sal's Realm!